In the world of complicated watchmaking, that which might appear simple when seen from the dial may often be quite complicated when you turn a watch over and peer into its depths. In Kari Voutilainen’s case, not only does his style comprise an uncommon sort of complicated simplicity, it is also riddled with the thing that eludes many watchmakers: near perfection. That’s a big sentence, but in my estimation, it’s not overboard. Not by a long shot when we’re talking about Kari Voutilainen. Kari Voutilainen is a thirty-year veteran of the watch industry, with his perfectionist tendencies originating not only in a decade spent in Parmigiani Fleurier’s renowned restoration department, but also from a stint teaching at Switzerland’s famed WOSTEP watchmaking school. In 2002, Voutilainen settled in the village of Môtiers, not far from the Parmigiani factory in Fleurier, and opened his own small atelier to create unique horological delicacies and bespoke timepieces for connoisseurs. Here, in the shadow of a medieval castle, Voutilainen creates timepieces that are classic in appearance, but really reveal their technical prowess when viewed from the other side. “I like technical watches,” the reserved Finn explains. 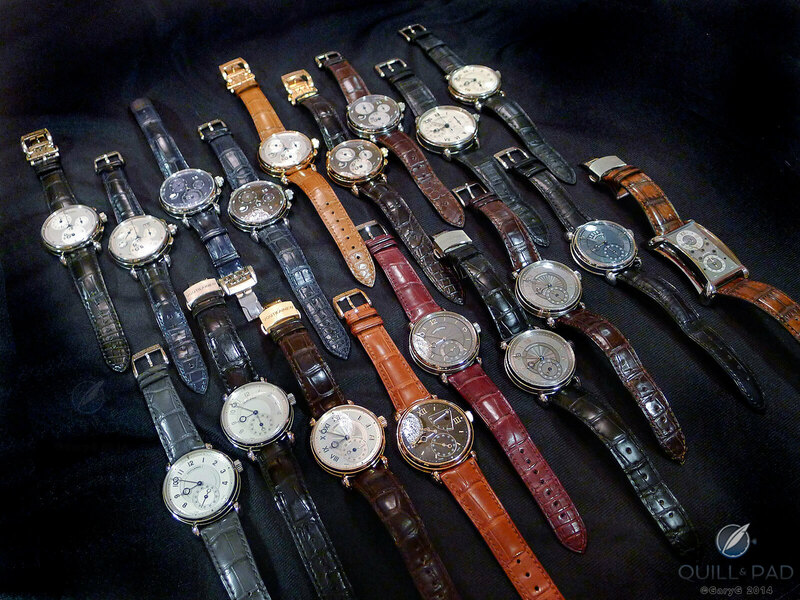 Voutilainen’s “job” is so much more than that to him; it is truly his calling. He eats, breathes and sleeps horology. Up to the official founding of his own workshop in 2002, he spent all of his free time working on a pocket watch tourbillon followed by a marine chronometer and various other projects including translating technical horological documents. To finance his own ideas, Voutilainen has always worked with other creators and companies, aiding them in movement design, prototyping and finishing. Some of the companies he works with also constitute his good friends: MB&F’s Legacy Machines and almost everything by the modern incarnation of Urban Jürgensen spring to mind. His own style could well be described as a continuation of traditional style; elements he finds in the annals of horological history – even recent horological history as in the case of the decimal repeaters he has made since 2005, which are based on vintage LeCoultre movements – are refreshed and invigorated for use in his own oeuvres. Though he claims to be a watchmaker rather than a designer, his design is so unique that it is immediately recognizable at first glance. “The result will always have my gold thread running through it – in the end it always looks the way I want it to,” he told me once. The latest element to take hold of his passions is the collaboration with Japanese lacquer studio Unryuan. Under the careful guidance of T. Kitamura, its skilled artists create fascinating microcosms comprising traditional crafts of the Edo period, which Voutilainen uses as a dial to top off his equally fascinating mechanical microcosms of horological art. The dial, like the manually wound movement containing Voutilainen’s own escapement based on the principle of Abraham-Louis Breguet’s échappement naturel, takes months to complete. Aside from his own artistic indulgences, Voutilainen’s business thrives on making his customers’ wishes come true; this is where the art of the bespoke timepiece can be found. Voutilainen’s art has already been recognized and rewarded by two Grand Prix d’Horlogerie de Genève juries, who have twice awarded him the prize for best men’s watch: in 2007 for the Observatoire and again in 2013 for the V-8R. For further information on Voutilainen, please read two books that have showcased his art: my own 12 Faces of Time with original photography by Ralf Baumgarten and the recently self-released Kari Voutilainen Horlogerie d’Art, which celebrates Voutilainen’s thirtieth anniversary of work as a watchmaker. This book is also beautifully photographed – by both Baumgarten and our friend Guy Lucas de Peslouan – and written by Theodore Diehl. In winning the 2014 Gaïa Award for Artisanal Creation, Voutilainen joins 19 years’ of winners that include the likes of François-Paul Journe, his previous boss Michel Parmigiani, Derek Pratt (who co-created many Jürgensen works with him), George Daniels, Beat Haldimann, Swatch’s Jacques Müller and Elmar Mock, Corum’s René Bannwart, automaton maker François Junod, Eric Coudray of Cabestan and Jaeger-LeCoultre and his A.H.C. I. colleagues Vincent Calabrese, Philippe Dufour, Paul Gerber, and (last year’s winner) Andreas Strehler in this category. For more information, please visit www.chaux-de-fonds.ch/musees/mih/prix-gaia and www.voutilainen.ch.